The Aston Martin DBS Superleggera has arrived in Malaysia to replace the naturally aspirated Vanquish S for the top spot in the British marque’s line-up, boasting an uprated version of the 5.2 litre biturbo V12 which also served in the DB11 and now, the DB11 AMR. Here, the twelve-pot powerplant produces 715 hp at 6,500 rpm and 900 Nm of torque between 1,800 rpm and 5,000 rpm, making it 85 hp and 200 Nm stronger than in the DB11 AMR. Driveline for the DBS Superleggera continues to be an eight-speed ZF automatic – a rear-mounted transaxle, for a 51:49 front-to-rear weight distribution – with a limited slip-differential, albeit one that is an uprated unit with higher torque capacity to support this car’s greater outputs. This enables a 0-100 km/h sprint time of 3.4 seconds, while top speed is rated at 340 km/h, at which 180 kg of downforce is produced by the bodywork. An evolution of the DB11’s bonded aluminium structure is used for the DBS Superleggera, clothed in carbon-fibre body panels. Suspension is tasked to forged double wishbones and a multi-link setup for the front and rear, respectively, with adaptive dampers. Three dynamic drive modes – GT, Sport and Sport Plus – can be selected for both powertrain and chassis, the former controlling engine and gearbox responses together. Rolling stock comprises 21-inch wheels fitted with tyres measuring 265/35ZR21 in front and 305/30ZR21 at the back, which are home to carbon-ceramic brake discs of 410 mm and 360 mm diameters front and rear, respectively. This Y-spoke design comes in three finishes, with a twin-spoke design in two finishes. Inside, the DBS Superleggera features the Bang & Olufsen audio system as part of an infotainment pack which combines iOS mobile device integration, USB playback, digital and FM/AM radio, Bluetooth and satellite navigation, viewed through an eight-inch display and controlled via a centre console touchpad. Naturally, all manner of personalisation is possible, from contrast stitching to paint-to-sample finishes. The price for this range-topping, bent-twelve super GT? RM2.88 million including taxes as specified here, or RM1.205 million before duties or options – applicable duties ring the till for RM1.5 million, according to an Aston Martin representative. 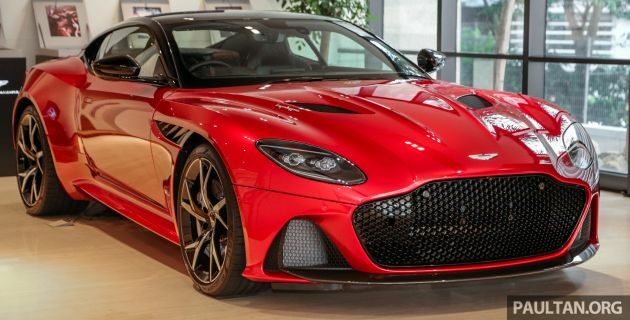 So far, there have been three confirmed bookings for the DBS Superleggera, which will go towards an estimated overall volume of 20 units for the marque in Malaysia this year. The post Aston Martin DBS Superleggera in Malaysia: RM2.88m appeared first on Paul Tan's Automotive News. 0 Response to "Aston Martin DBS Superleggera in Malaysia: RM2.88m"